Most of us feel a shiver when a spider pops up out of nowhere! It’s a fear that we can’t quite explain. The eight, long, hairy legs and their fast movements probably have something to do with it. Over summer, 150 million spiders invaded our homes and now they’ve reached full adult maturity, they are bigger than ever! Don’t be fooled by the size. Although it isn’t the largest spider you’ll see in your garden shed, they are by far the most venomous! Female false widows are known to of bitten humans, but they aren’t usually aggressive and attacks are rare. Appearance: A Glossy brown bulbous body of 10mm and a leg span of up to 35mm. The legs are a dark, orangey brown colour which is different to the shiny black of a true widow spider. Spot the cream patterning on top of the body, which looks like a skull design. Behaviour: False widows like environments where they aren’t likely to be disturbed and are often seen in garden sheds or outbuildings. They are nocturnal and will be hidden behind a shovel or under a windowsill in the day. They also prefer south facing walls as they are warmer. At night, you’ll catch them upside down hanging from their web. These scary eight-legged species are most commonly found in your shed during autumn months when they leave their webs in search of females. It’s one of the largest spiders in the UK and can grow up to 12cm wide! You’d definitely jump if you saw one of these! Appearance: Giant house spiders are either dark orange, brown or beige and grow up to 12 cm wide, making them one of the largest of the spiders on this list. Behaviour: These spiders are extremely fast! They build large webs in sheds and garages where they are less likely to get disturbed. They also possess potent venom but will very rarely aggressive. These are the largest, and arguably the most frightening spider you’ll come across in your garden shed. Also known as the Tegenaria Parientina, the Cardinal Spider can grow up to 14cm wide. The will live in buildings or walls but a shed makes a great place to hunt. Appearance: The look much scarier than they actually are. Notice how they are the reddish brown in colour but younger offspring can be paler before their last molt. Behaviour: Cardinal spiders are nocturnal and have been known to occasionally bite but the bites are painless. A common spider which is found widespread in the UK is the Lace Web Spider. It’s usually lurking on outdoor walls and fencing but will venture indoors during Autumn to look for a mate. 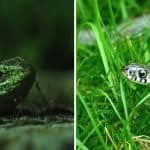 They are also venomous and can give a painful bite, so it’s best not to disturb them. Lace Web Spiders leave a painful bite which lasts for 12 hours! Appearance: You’ll distinguish this spider from the brown colour with yellow markings on the abdomen. They can grow up to around 20cm in size, making them one of the smaller spiders on the list. Behaviour: You’ll want to avoid these spiders as they leave a nasty bite which can be painful. Symptoms will ease off after 12 hours. Heavy rainfall will usually force them to look for a home in a garden shed. This tiny spider is not to be underestimated, they can produce a bite and also leap into the air! They will spot them most in autumn where they can be found on garden building walls and in garden sheds. Appearance: Zebra jumping spiders have distinctive black and white markings and are the small size of just 8mm. 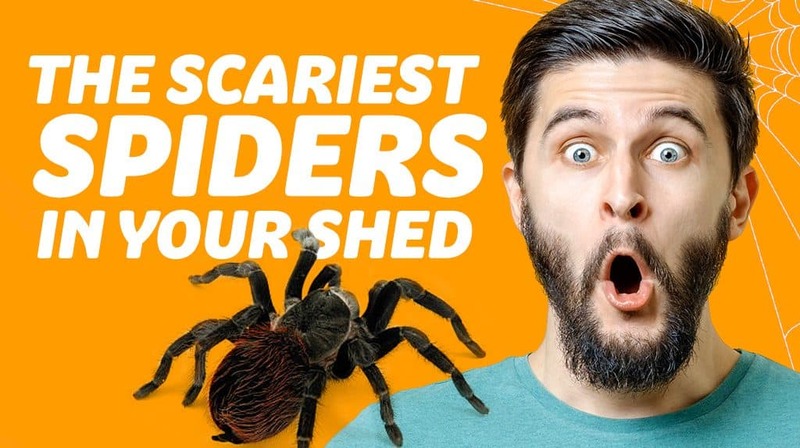 Although they don’t look as frightening as some of the spiders on this list, they do bite! Behaviour: These tiny spiders can give a painful nip, although they aren’t aggressive and the venom isn’t medically threatening. They are also more likely to run away in the presence of humans than they are to bite so you needn’t be too worried. You’re guaranteed to see some of these scary spiders this autumn but don’t fear! The majority of spiders in the UK are completely harmless and look a lot more terrifying than they actually are. If you use your shed often or have you own garden workshop or studio, you can also spider proof your shed to keep them out!